Send in your ride too! The Performance Professor Lecture Series is a series of classroom-style presentations by which fundamental engine and vehicle components and theories will be examined and explained. Core to the on-going series is a sharing of information that will make your vehicle more powerful, functional, fast, and simply more fun to drive. The concept is not about race cars only. Rather, you can expect an assortment of features that address the interests of the high performance enthusiast, "hobby" engine builder, and amateur motorsports participant, as well as owners of light- and medium-duty trucks used for towing/hauling/work. Selected materials are suitable for use by trade/technical school instructors as supplemental to traditional information. Information will be presented at two levels of instruction: Basic and Advanced information. This approach has been selected because of the wide range in interests and backgrounds of the n2performance.com site visitor. Each lecture will include an interview with industry-known personnel, and a self-test section to help you determine how much of the material was retained. It'll be fun and particularly informative. 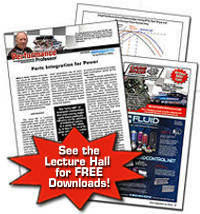 If you are new to the high-performance scene we suggest you begin by downloading the first lecture entitled "Airflow and the Internal Combustion Engine" and only after those concepts are understood should you move on to subsequent lectures. Past lectures are located in the Archive section of the Lecture Hall. .
N2Performance.com publishes a new "Performance Professor Lecture" each month. By signing up for a free subscription, subscribers can download lectures from our servers at no charge. Lectures are created and distributed in PDF.